Ever since I was very young I wanted to make films. When I was in middle school, I learned how to use cameras and editing bays and everyone associated with TV production at the middle school’s public access TV studio that it had in the basement. Then, when I was in High School, I started making silly short films, and then eventually I made silly YouTube shorts. Once the DSLR revolution hit, I realized I could make a feature film if I wanted to, so I did. That was SHREDDER, which was a more mature work than anything I’d done before. I always wanted to make serious films, but it’s just a lot more fun to make silly stuff when you’re starting out and still learning. RAMEKIN came from an in-joke between my girlfriend Chloe and I. It was very funny to us how scary-sounding the word ramekin is, when it means something so innocuous and not-at-all scary: a tiny white porcelain cup. It got to the point where she’d text me Google Image searched pictures of ramekins, and I’d feign fear of them. 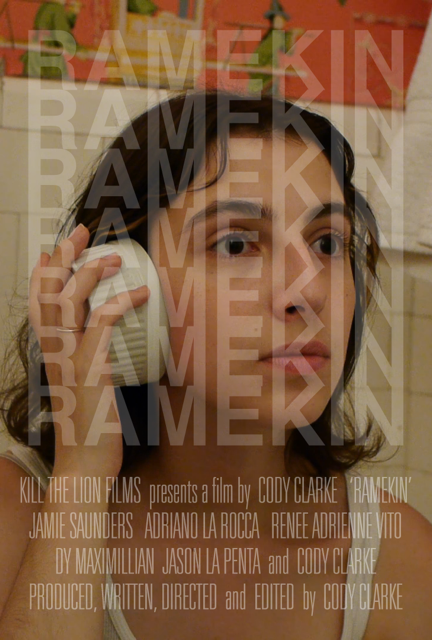 Not long after that I realized that I had to make a horror movie about a ramekin, called RAMEKIN. I didn’t have much of a story idea, and no script yet, so I looked around on Backstage to see if I saw any actresses I thought could play the lead in it, cause I knew I wanted a female protagonist. The first person I saw on the site was Jamie Saunders, and once I saw her the film wrote itself in my mind. I reached out to her and she was interested, we met up and hit it off really well, and the rest is history! I wrote the script in about two weeks after I met her, and we started production. I think my three feature films are all pretty similar, in that someone could probably tell they’re all films of mine even though they’re pretty different—I don’t like moving the camera ever, I care a lot about composition and light and color, and the films are all kind of about introverts going through something. I’d say the biggest difference is between my early shorts and my feature films. I don’t think my early shorts are reflective at all of my skills as a filmmaker, because that all intentionally took a backseat to just making stuff quickly and making stuff I thought was funny. I wasn’t trying to create something beautiful or dense in any way back then. Which isn’t to say I didn’t want to, just that it was a different type of art. There’s a line in the film where Jamie Saunders, as Emily, says she has a splotchy birthmark on her leg. When I wrote the film, I figured I’d have to put some makeup on her leg or something for any shots where her leg is seen. When it got time to shoot a shot where her leg would be seen, I was like ‘eh, let’s just scrap that line, I don’t feel like giving you a fake splotchy birthmark’. To which she said, ‘but I actually do have a splotchy birthmark on my leg’, and she showed me. I had literally no idea she did when I wrote the script. I believe artists can be kind of psychic in a way, that they see the future somewhat in order to create anything, and that experience definitely felt like further proof of that. That kinda stuff happens to me in small ways all the time whenever I’m working on something, but that was the biggest example. As far as funny stuff, it wasn’t so much that funny stuff would occur on set, just that everyone on the set had a good sense of humor, so when not shooting we were always laughing and happy. Everyone really adored each other. Good times were had. I’ve never heard of either, Googling it I guess it seems to be a UK thing that y'all have started. I do like film manifestos, they can lead to interesting films that wouldn’t exist otherwise. The Pink8 manifesto seems in line with the kind of stuff I make. My documentary REHEARSALS probably most closely fits with it. I’m working on three feature films simultaneously right now and making them all by the end of the year. I’m making up for lost time because it was 6 years between my 2nd film and my 3rd film. Life got in the way, some tragedies I had to deal with. I’d like to average out to about a film a year for my film career. The three films I’m in pre-production on right now are all very different from each other, and from what I’ve made before, but are all very me. If people like my other stuff, they’ll like these new ones. And if people don’t like my other stuff, there’s still a chance they’d like my new stuff. I don’t really care about that though, I just make stuff I like. I trust my own taste as a barometer.